We love designing spaces in beautiful locations. The view creates such an inspiring backdrop. In the case of this project, we had started design plans for the owner's original house which was then destroyed in Hurricane Sandy. Our client said he "had the occasion to observe Susan's work at the Hilton Garden Inn and was impressed". When the owners were ready to rebuild, they contacted us to be a part of the project, quite literally, from the ground up. 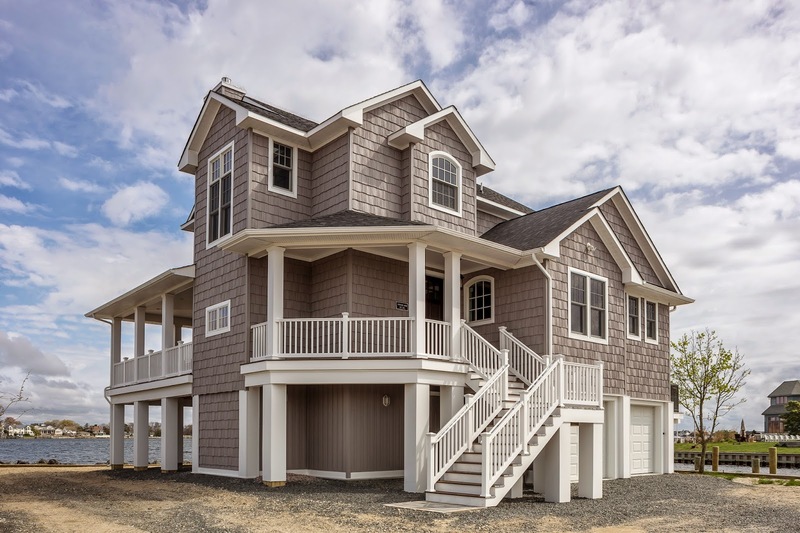 We were hired, once again, to give this family their coastal dream home ready in time for summer at the beach. 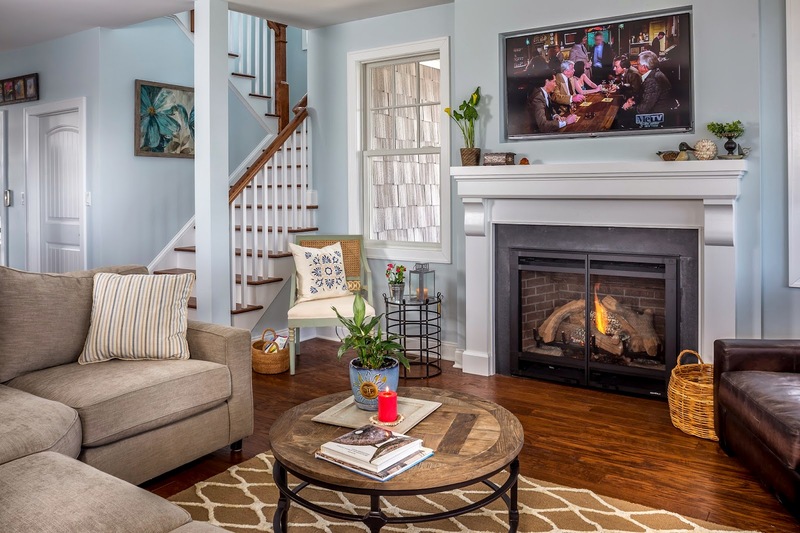 We were able to interview the home owner after this amazing project was finished to give our readers an inside look from a client's perspective. They brought up an important, often overlooked, issue. "When building a home, you are confronted with too many choices. It is overwhelming. I am not sure how anyone does it without professional help." We agree. American & International Designs, Inc. offers design and concierge services to all of our clients. "During the project, we had all sorts of questions that transcended what an interior designer normally does. Susan and her team were able to answer them all and help solve issues along the way. They went above and beyond." We really strive to please our clients not only with the beautiful finished product but with all of the steps in between. "American & International Designs, Inc. makes clients feel comfortable and confident in their abilities"
"My wife and I are ecstatic with the finished product. 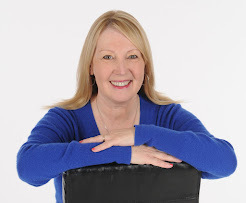 It is what we dreamed it would be in no small measure with the help from Susan and her team." We love the choice of gray cedar shakes against the black roof and clean white trim. This is a classic beach community look along with the a variety of window sizes and shapes to bring in the abundance of natural light and amazing views. On the inside we used Benjamin Moore's Constellation AF-540 in an ultra flat low VOC finish to mimic the cool waters as seen out of every window. Keeping furniture lines low helps to not block the spectacular views. The sectional sofa from Pottery Barn in a neutral tweed fabric is both functional and aesthetically pleasing. Adding more seating between the fireplace and the stairway is a great way to highlight what could have been a hidden window. A neutral palette helps to keep focus on the features of the home. 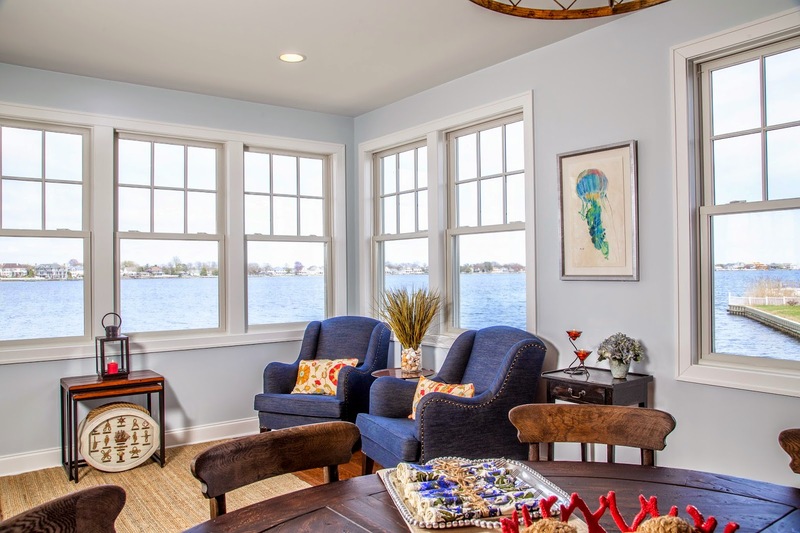 Having a property right on the water creates a focal point with every window and the challenge is to design a space that compliments the view without trying to overpower it. 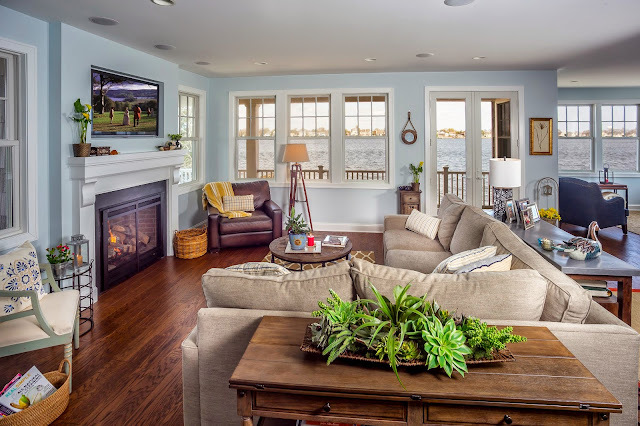 Creating a variety of seating areas helps to fill large open spaces while still making them feel warm and cozy. It also gives guests plenty of areas to enjoy down time at the beach. 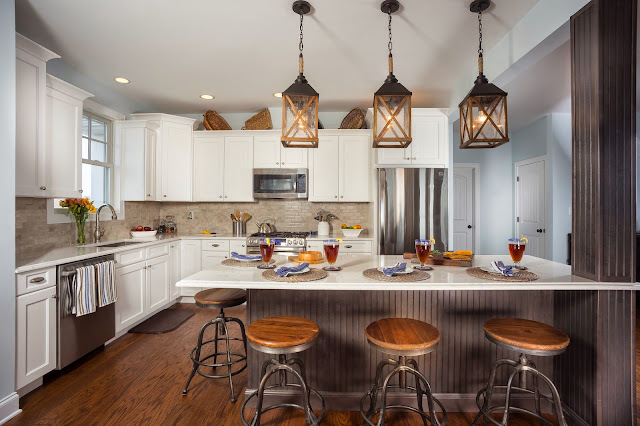 This kitchen offers all of the amenities of home while away at the beach. White cabinets and Caesar stone counter tops blend into the background while contrasting beautifully with the hand scraped wood floors. A giant island creates a casual everyday dining space while also serving as a perfect work surface and helpful serving area when entertaining. 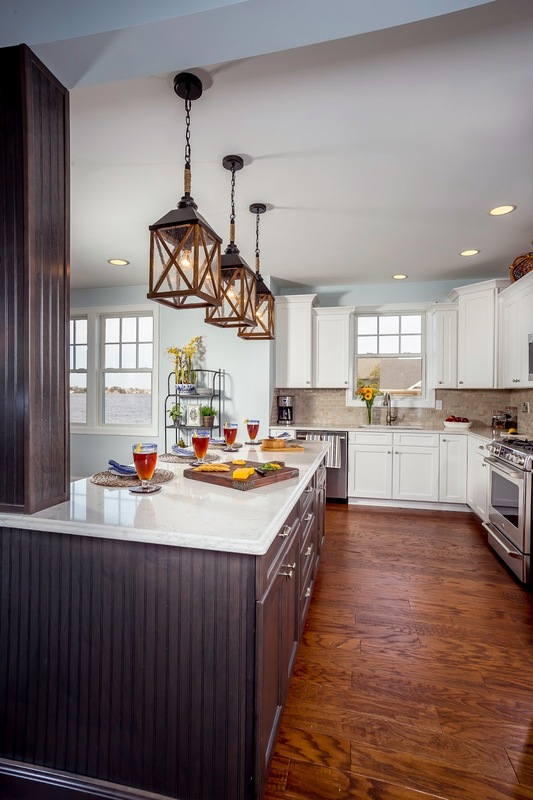 Using dark cabinets and wainscoting helps to make the island a statement piece. The oil rubbed bronze and dark weathered oak lantern pendants adorning the island by Feiss create separation without blocking the view. We were so proud to help create this client's coastal dream home. We are always amazed and inspired with each property we design and each client we design for.